West Coast artist Robert Ramsey seems to have had only a couple of 45s released but they are both really first class. The mid paced Like It Stands, beautifully arranged by Rene Hall, reveals Ramsey to have a fine baritone voice with a few Otis Redding touches in the "gotta gotta" refrains, and a fine sense of dynamics particularly on those hair raising screams. 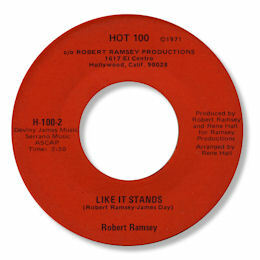 Ramsey put it out on his own Hot 100 label before it was picked up by Kent for wider distribution. Sadly it didn't really register with buyers. 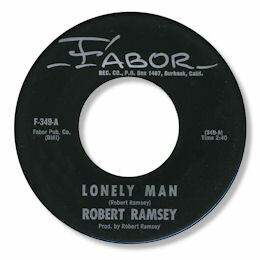 His other 45 is the fine ballad Lonely Man on which his vocals are as powerful and persuasive as before. This lovely tune has one of the strangest tenor sax solos I know in the middle of it. Instead of a measured piece to match the tempo of the tune, the guy goes off into a manic series of notes sounding more like a free jazz player off on a spree than somebody embellishing a deep soul number. Extraordinary. In his notes to the third volume of his deep soul CDs Dave Godin says of Ramsey "originating from the south Robert Ramsey had moved to LA with his wife Vivian and was last heard working as a program director on a local radio station..." That was in 2000 - can anybody update the info? 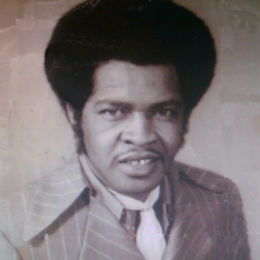 UPDATE ~ Robert's son - also called Robert - has kindly been in touch I'm delighted to say, and he has provided the lovely pic of his father. I'm really grateful to him. Note ~ "Like It Stands" can be found on the CD Vol 3 of Dave Godin's "Deep Soul Treasures" on Ace UK.